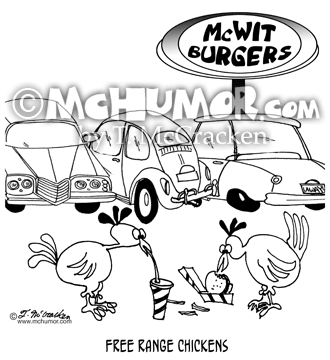 Parking Lot Cartoon 7784: “Free Range Chickens." 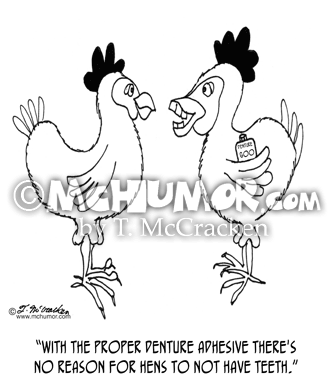 Chickens roaming in front of a fast food place eat discarded burgers and soda. 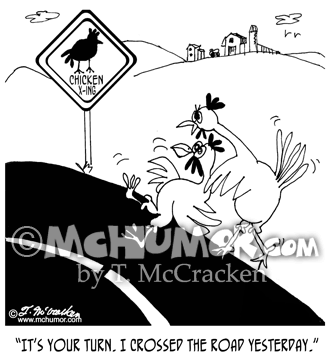 Chicken Cartoon 7385: A chicken in front of a "Chicken Crossing" sign pushing another into the road saying, "It's your turn. 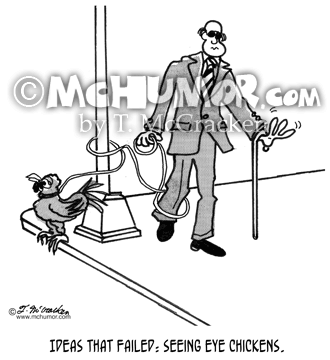 I crossed the road yesterday." 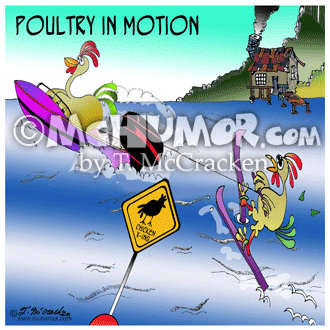 Water Skiing Cartoon 7656: "Poultry in Motion" Chickens drive a boat and water ski in a Chicken X-ing zone on a lake. 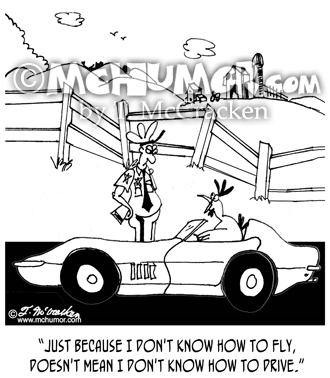 Chicken Cartoon 6482: A chicken driving a car saying to a police officer who's stopped him, "Just because I don't know how to fly, doesn't mean I don't know how to drive." 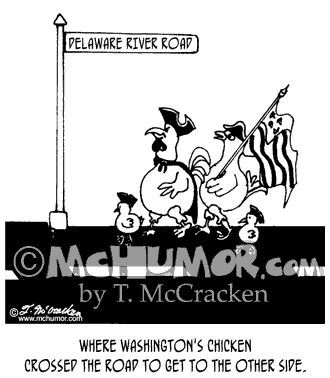 Chicken Cartoon 3441: “Where Washington's chicken crossed the road to get to the other side.” Chickens wearing tri-horn hats and carrying old flags walk across Delaware River Road. 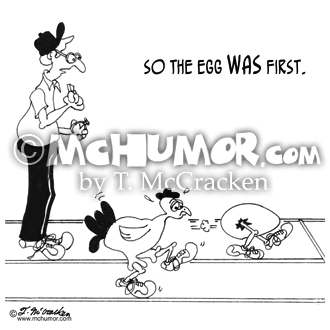 Chicken Cartoon 5087: In a race between a chicken and an egg the track official says, "So, the egg WAS first." 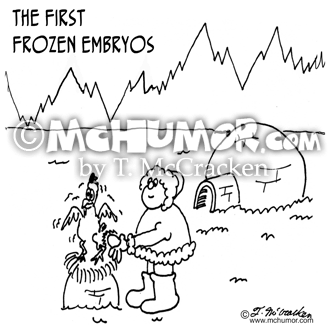 Chicken Cartoon 5998: "The First Frozen Embryos." An Eskimo takes an egg from under a chicken laying eggs on top of an igloo. 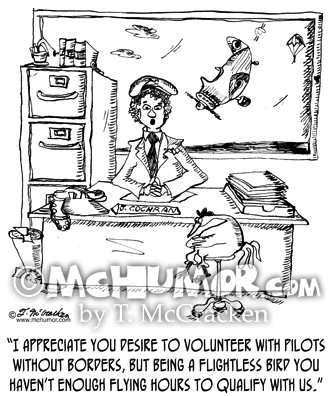 Chicken Cartoon 7551: A pilot says to a chicken, "I appreciate you desire to volunteer with Pilots Without Borders, but being a flightless bird you haven't enough flying hours to qualify with us."